Seventeen year-old Layla Labelle's hallucinations have driven her to the brink—and she isn't telling anyone. But when her dreams walk into her life in the form of Max MacLarnon, she is forced to rethink everything she thought she knew. Including whether or not Max actually exists. Learning the truth will mean fighting an arsenal of demons, and being with Max will put her on a path toward her own destruction. When Layla’s world erupts into a dangerous reality, and every fact of her life forsakes her, she must remember who, and what, she is if she's going to stay alive. 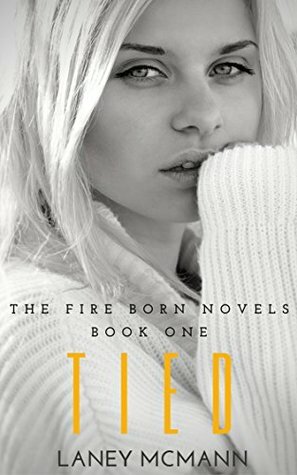 In TIED, Book One of The Fire Born Novels, what Layla and Max don't know could kill them both. And unless they can find a way to stop the curse—the truth might tear them apart forever. How far would you go ... to protect the one you love? I think that this is a good romance. BUT just know that this is FOR SURE a romance, very lovey dovey. The interesting thing about this book is that it involves wars and powers. I really like that we get to see celtic gods in this story rather than the typical Zeus. I like that we get some of the celtic heritage in this story as well. But I found that Layla got annoying at some points. But overall it was a good read.